Our product range includes a wide range of termite free kitchens, stainless steel modular kitchen and modern stainless steel modular kitchen. Backed ourselves with sound amenities and talented personnel, we have emerged as one of the leading Pull Down Rack. In order to assure about the quality of offered Pull Down Racks, we use top quality material for manufacturing. After the finishing of the manufacturing process, we check these Pull Down Racks on several quality provisions so as to assure the flawlessness. In addition, customers can take the offered Pull Down Racks at reasonable rates. Being perfectly shaped and swift movement of our organization, we are instrumental in offering wide gamut of Modern Stainless Steel Modular Kitchen. Our range of Modern Stainless Steel Modular Kitchen is designed using modern machinery & latest technology. Our Modern Stainless Steel Modular Kitchen are extensively treasured by the customers due to their quality features like perfect finish and longer life. 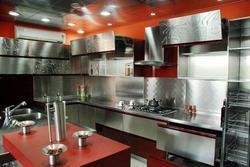 Our dear customers can easily take these Modern Stainless Steel Modular Kitchen at nominal rates.